I have been planning on a hiking trip to the Canadian Rockies ever since a Banff calendar crossed my sight about five years ago. My dream finally got realised in the summer of 2005, when me and my wife went on a two week vacation to the national parks of the Alberta-British Columbia border. After our experiences with a wet vacation in the beginning of summer in New Zealand, couple of years ago, we decided to push this trip to the end of summer - just to change things a bit. Our gamble paid off... well almost. After what was one of the wettest June and July in its history, the region was blessed with one of the longest stretch of good weather in early August when we happened to visit there. We did have a couple of dreary days. But it came at the fag end of the trip and that too on the couple of soft days we had kept aside to recover from our "walks". 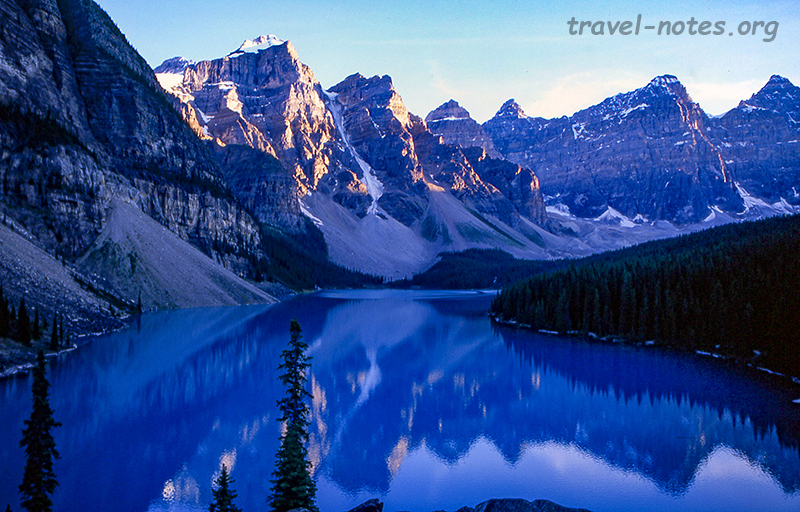 Banff National Park, which by the by is the first national park in Canada, was our first destination. We spent an hour riding the gondola in Banff, the city, before quickly heading off to the hiker's paradise of Lake Louise. 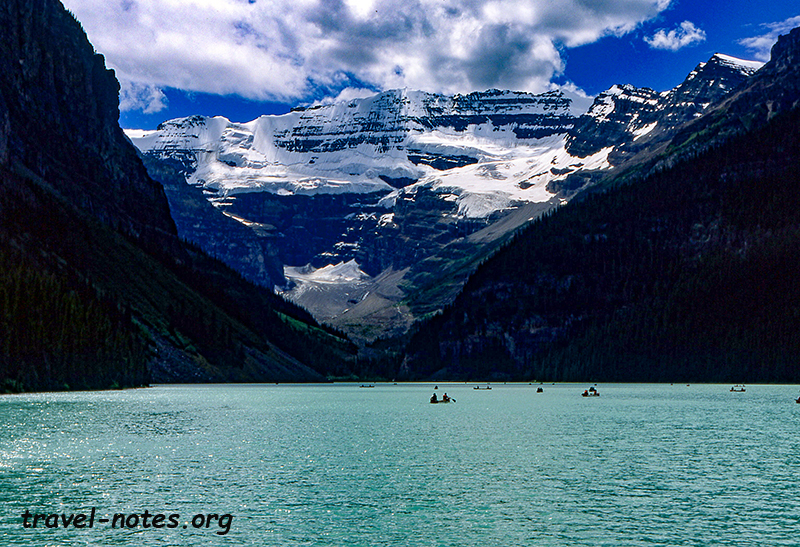 Lake Louise with the majestic glaciers as its background is the most famous of the many multi-coloured alpine lakes adorning this region. Our biggest disappointment of the trip greeted us in Lake Louise in the form of trail restrictions. The park authorities somehow managed to determine that the area's bears are some sort of mathematical geniuses who spend their time carefully counting the number of people in a group and promptly attacking any groups of less than six members. So all the trails including the Paradise Valley hike (the most popular one in the entire region) was closed to groups smaller than half a dozen. So couples, such as us, were forced to walk lesser trails or hunt for couples with similar itinerary and physical abilities. We found the former to be a more viable option. We decided to fill the sudden vacuum in our schedule with a hike up the Fairview Mountain. It was a disastrous decision as the walk boasted a km elevation gain within about 6 kms of walk. We gave up about half way and returned with sore legs, splitting headache and battered egos. We managed to salvage some pride on the following day by combining the two popular hikes to the two tea houses behind the Lake Louise - yes, the walks do end in real tea houses serving hot beverages! These two walks were one of the few ones in the region devoid of any people counting beasts. We also packed in a climb up the local maxima (viz., Big Beehive) to make it an exhausting 8 hours 20 kms trip. But the views of the lake was worth every drop of sweat shed. In order to rest our suddenly over-stressed muscles, we decided to spend the following day driving to the two often neglected parks of the region - Glacier (not to be confused with its namesake in Montana) and Mt. Revelstoke. These parks are less famous not because they lack scenery, but because they get dwarfed by the giants to their west - Banff and Jasper which manage to catch most of the tourist traffic. Icefield Parkway (Rte 93) connecting Banff and Jasper National Parks would easily make it to everyone's top ten scenic routes on the planet. It took us nearly an entire day to cover the 230 km distance - the slowness induced not by traffic, but by the photo and hike stops induced by jaw dropping scenery and meandering wild lives. 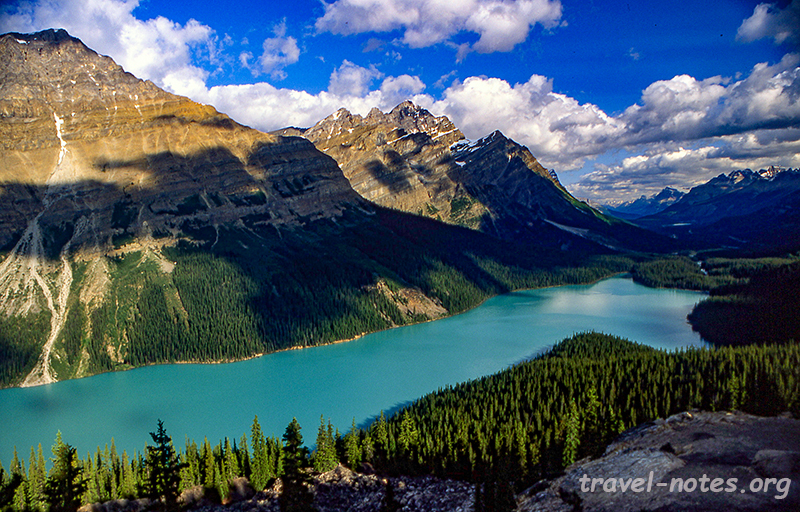 The pick of the stops were the hauntingly beautiful Peyto Lake, the hike up the Wilcox Pass along with its rewarding views of the Columbia Icefield and a stroll to five pristine lakes in the Valley of Five Lakes. After hiding inside our sleeping bag in a rustic hostel in Jasper, we made our way to our next destination - Maligne Lake region in Jasper National Park. We spent all morning walking up the Bald Hills (10.4 kms, 5 hrs) to take in some spectacular views of the lake and spent all afternoon cruising the lake to reach the most photographed portion of it - the Spirit Island. To cap it all, we ended the day in one of the most breathtaking location - a hostel nestled at the base of Mt. Edith Cavell - one of the most striking peaks in the park. The following morning, we did the Path of the Glacier and Cavell Meadows hikes (9.1 kms 4 hrs) which gave us even better views of the mountain and the Angel Glacier nestled between it and the nearby Sorrow Peak. After another stop filled trip down the Icefield Parkway, we made our way back to Banff. Between our two hikes in Yoho National Park (detailed on the next page), we spent another morning in Banff when we covered yet another popular hike of the park - a walk to the bubbling pools of ink-pots and two falls in the Johnston Canyon. The trail head is located on the scenic Bow Valley Parkway making the drive to the trail as enjoyable as the walk. Oh yeah! I almost forgot! There is also Kootenay National Park hiding in the region, the least visited of the big four (other three being Banff, Jasper and Yoho). It isn't as popular as the park isn't very weekend warrior friendly. Almost all of the gems of the park needs a hike and almost all of these hikes are either overnighters or candidates for iron man contests. Like most visitors, we only did the only available short hike (to the old ochre mines of Paint Pots) and the only available day hike (to the Stanley Glacier). The walk to the latter is marketed as the "fire and ice" trail as the trail passes through a brilliantly verdant forests emerging from a blackened older forests destroyed by fire before reaching the hanging Stanley Glacier. 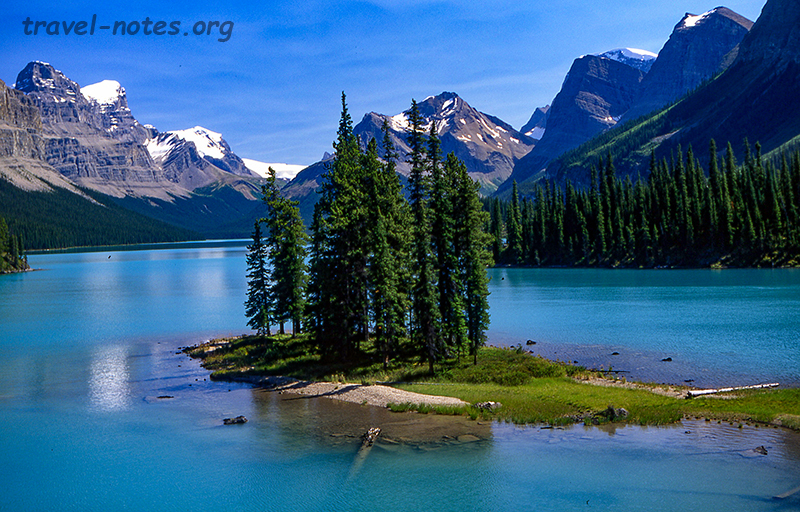 Click here for more photos from Banff National Park. 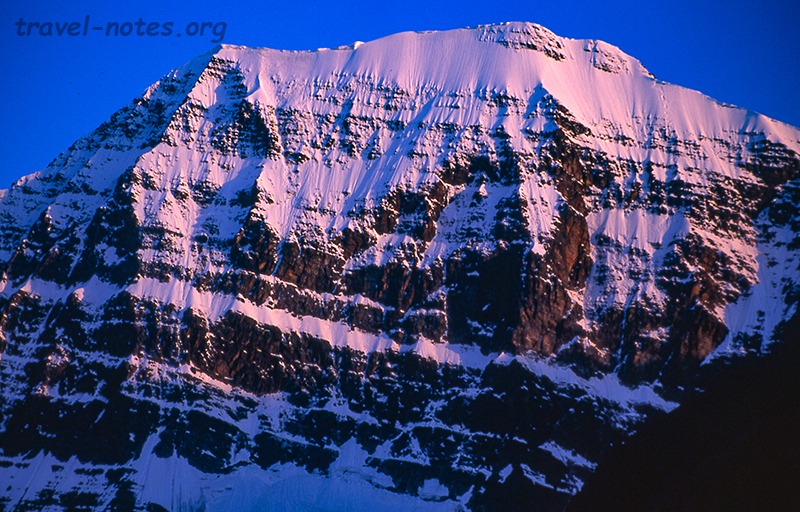 Click here for more photos from Icefields Parkway. Click here for more photos from Jasper National Park. 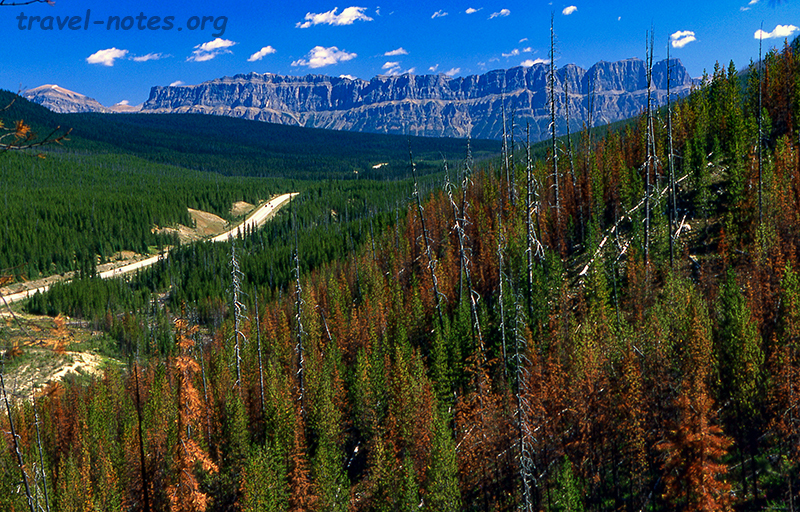 Click here for more photos from Kootenay National Park.